Presto Lifts Fixed Height Tilters with 1000 - 6000 pound capacities and 30, 45 and 60 degree tilt. 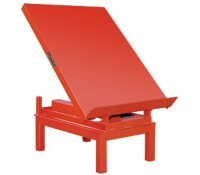 These fixed height tilt tops can be mounted on legs, workbenches or directly on the floor. They are ideal for odd shaped or sized containers or odd loads. Internal 1/2 HP 115/1/60 power unit. Powered down cylinders on TT60 Series with 12". TT30 & TT45 units can be mounted to the floor, on floor stands, or on top of scissor lifts. Hand held control with 8' coil cord. 8" standard lip, optional lips up to 24".